Making the most of your exhibition stand involves focusing on two key things; attracting visitors to your stand and interacting with them once they are there. If you get both right then you can expect to see new customer connections, increased sales and conversions and plenty of new business leads. The first stage is working out how you are going to attract visitors to your stand, then you concentrate on keeping them there for as long as possible. The competition in an exhibition hall can be really tough so you need to pull out all the stops if you plan to exceed expectations and win the eye of the visitors. Here are a few things to think about when planning your event that will help increase your success. It’s a good idea to entice people to your stand even before the actual event. Some simple yet effective pre-event marketing will do the trick. This can be anything from targeted email campaigns to social media campaigns. While you’ll be meeting many new faces at the exhibition, it’s important to let the people that already follow your business know that you’re going to be there. It is also important to let people know that they are welcome to come and meet with you. You can include details of the event in newsletters you send out or create an email specifically to let people know where you’ll be when it is and what you’ll be doing there. Another good way is to include details of the event in all employee’s email signatures. If your team sends outbound emails often you’re sure to catch the attention of a few people that may want to meet you and your team. Finally, make sure you are taking full advantage of social media. Facebook, Twitter, Instagram and LinkedIn are the big ones you don’t want to miss, but if you have Google+, Pinterest, YouTube or any other social accounts there’s no reason why you can’t post there too. Be sure to include any event hashtags, and post on the event's social media pages. This enables you to reach out to people who are going to the event but don't necessarily know who you are or what you do. You can include any promotions you are running, details of any competitions or giveaways you are planning. This gives people another reason to add you to their list for visiting. Did you know - Research shows that on average 76% of trade show attendees arrive with a fixed agenda, this means they have a plan of who they want to visit, what they want to accomplish and when. This is why pre-event marketing is so important, it gives them time to plan a stop at your stand. Take time to design and create something interesting and captivating. Don’t rush in with any old message, exhibition display and plan. The look of your stand is so important that it is crucial you give the design of your stand some careful consideration. You have a matter of minutes to grab someone’s attention in order for them to approach you. 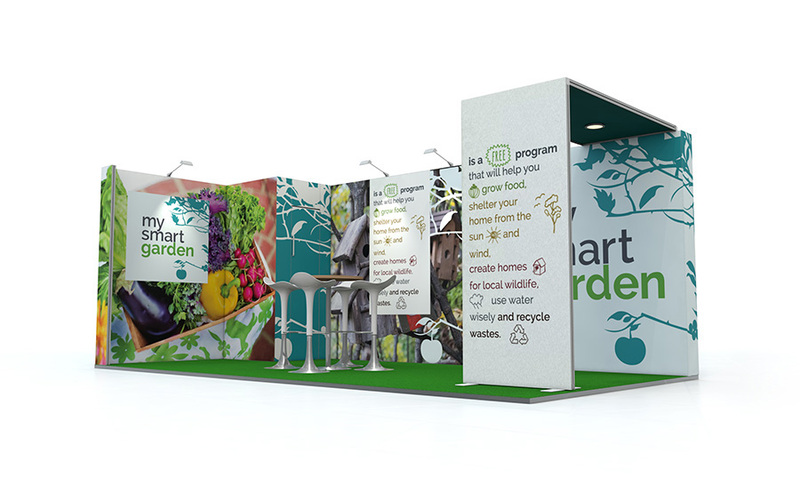 Your exhibition stand needs to be visually appealing with an attention-grabbing, snappy design. The type of exhibition stand you take will depend on your exhibition needs and what you can afford. We offer a wide range of portable, modular and bespoke exhibition stands with something to suit any budget. Portable exhibition stands come in a range of different styles, with numerous design options available. Portable stands, such as pop ups, roller banners and fabric exhibition stands are popular for exhibitors all over the world due to the flexibility and versatility they provide. Modular displays are the most flexible event systems available as you can add or take away sections from the display which means you can reconfigure your display to suit different event spaces. With clever artwork design, graphics can be added to, or fully replaced, without having to purchase a whole new exhibition stand - saving you money in the long term. Bespoke exhibition stands allow you to create your vision for your next event. You can choose what will benefit your business the most to your exact specifications, tell us your brief and we do the rest. Once you have decided on the type of exhibition stand, you need to consider graphic design. Steer clear of designs with lots of text, people don’t have time to stand and read line after line of text. People need clear definitive messages with obvious branding so they can make their decision there and then if your stand is worth the visit. If you design is ambiguous and people aren’t too sure what it is you do, it’s likely they will just avoid you. A well-designed stand sends out a message that your business is professional and competent. Graphics bring a stand to life and have a role in communicating your message, so think about the one thing you want people to remember from your stand and base your design around that. Sometimes less is more - you don’t want to overcrowd your space. Keep it simple but make sure you have everything you need. Always try to include a TV or monitor screen, this doesn’t take up too much floor space and allows you to showcase a wider side of your business. Our pop up monitor brackets or the XL 60 monitor stand can be built into our portable pop up stands. Truly hidden they take up very little space, yet provide you with a greater marketing opportunity. iPad stands enable you to add an interactive experience to your stand and allow the opportunity for visitors to browse your full product collection and services. 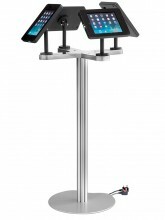 We offer a wide range of iPad stands to suit all budgets and applications. Once you have attracted visitors to your stand, you then need to engage them and keep them there long enough for you to complete your pitch. There is no ‘right or wrong’ way of doing this, instead, it’s best to combine a few techniques to maximise success. Have refreshments on your stand. This may sound obvious but it’s an important none the less. Offering tea and coffee can increase the number of visitors to your stand. Exhibitions are tiring and usually include very expensive trips to the café or coffee shop to refuel. By offering free refreshments you can entice people to stop at your stand and stay while you talk to them about your business. Interesting video content is another way of engaging with visitors. It gives you the chance to offer interesting information about your business without lots of expensive marketing literature. Get interactive by adding touchscreen technology to your stand. With the clever use of iPad stands, you can provide visitors with access to a wide range of interesting data such as videos, images, websites and much more. It’s also a clever way of gathering visitor data which you can follow up after the show. Taking the right team will have a huge impact on your event. People with good communication skills, business and industry knowledge will keep visitors interested in what you have to offer. Before the exhibition, you should make sure that all staff attending are fully trained and briefed on what is expected of them. Make sure everyone on your team understands what to do, but also what not to do, such as standing with arms crossed, hands in pockets, eating on the stand and using mobile phones. Giveaways are a great tool which can help to generate more traffic and increase brand awareness whilst at an exhibition or trade show. With the right give away visitors will leave your stand with a lasting impression of your business which can help to build lasting professional relationships. Read our article Exhibition Stand Giveaway Ideas for tips on choosing the right give away. A great way to attracting visitors to your exhibition stand is to run a competition. People love to compete and win and if they go away with a quality prize – even better. They will be more likely to remember you too. Try to run a competition which involves more than just dropping a business card into a bowl for a prize draw. Think of something which will engage people and encourage interaction. For tips and ideas for exhibition competitions please see our article Great Competitions to Engage Your Exhibition Stand Visitors. For more information on our products and services, or to discuss event tips for your next event, call us on 01733 511030 or email us.